6-Quart Portable Slow Cooker Just $19.88! Down From $40! Head over to Walmart to score The Pioneer Woman 6-Quart Portable Slow Cooker for just $19.88 down from $39.99 PLUS FREE store pick up or FREE shipping for orders $35 or more! 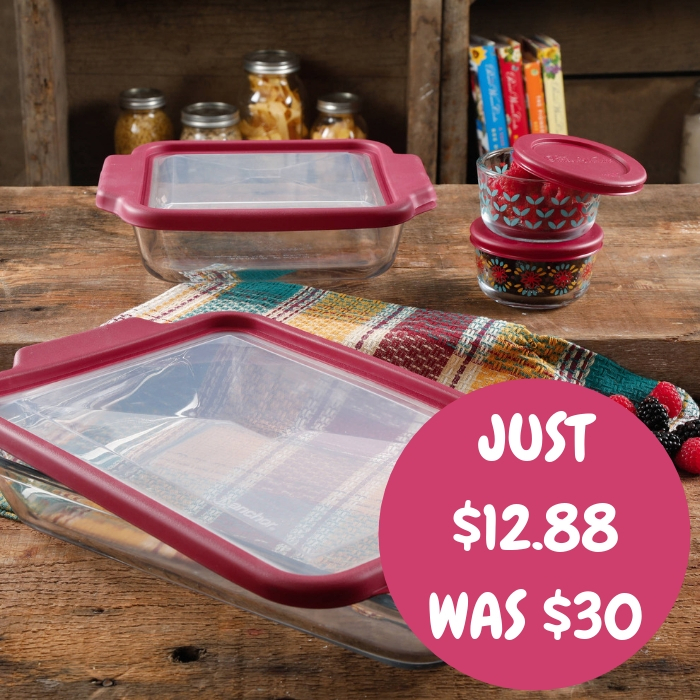 Take your warm dish to tailgates, potlucks and more without the risk of spills. Two clips lock the lid into place for mess-free travel, and full-grip handles make carrying it easy. Nothing’s quite as nice as the set-it-then-forget-it ease of a slow cooker. Feed the family a hearty, homemade meal without even turning on the stove! This 6-quart slow cooker fits a 6 pound chicken or 4 pound roast, and features High, Low and Warm heat settings. The Fiona Floral pattern encourages mixing and matching to complement your individual taste in the kitchen. 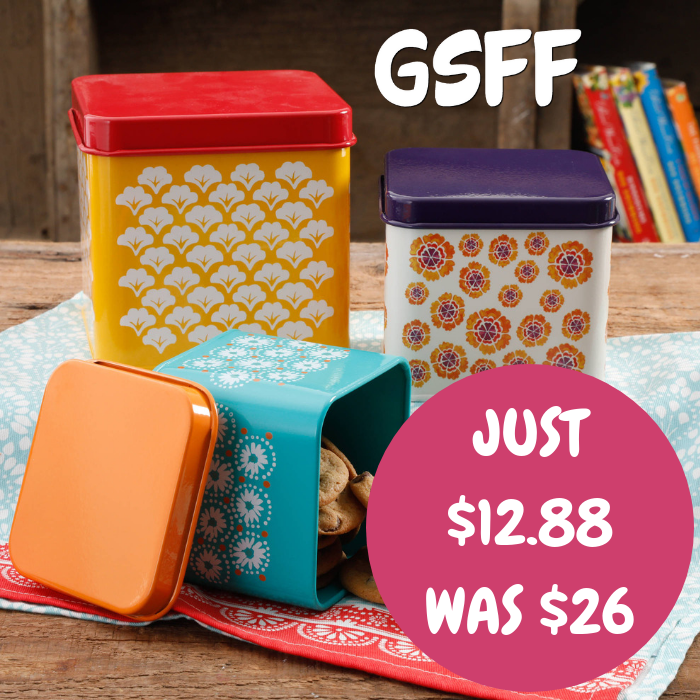 Removable stoneware crock & glass lid are dishwasher safe fir easy cleanup. Slow Cooker 2-Piece Set Just $19.99! Down From $45! 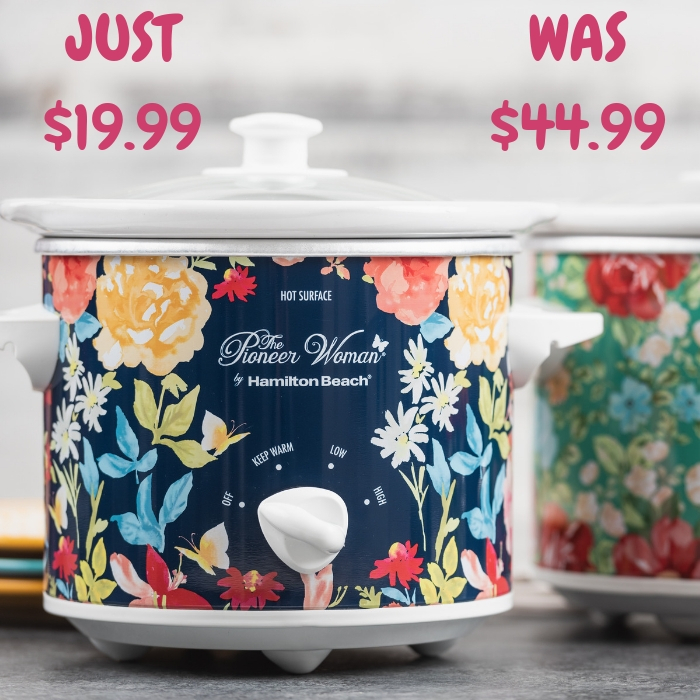 Walmart has The Pioneer Woman 1.5-Quart Slow Cooker 2-Piece Set on sale for just $19.99 down from $44.99 PLUS FREE store pick up or FREE shipping for orders $35 or more! Add a splash of color to your next party buffet while keeping your food warm. The 1.5 quart capacity is ideal for appetizers, fondue, sides or cooking for one or two. Bring The Pioneer Woman’s cheerful and charming style to your countertop with a beautiful pair of mini slow cookers. Wrapped in Fiona Floral and Vintage Floral designs, these slow cookers are perfect for entertaining or gift giving. Slow Cooker 2-Piece Set Just $23.99! Down From $45! 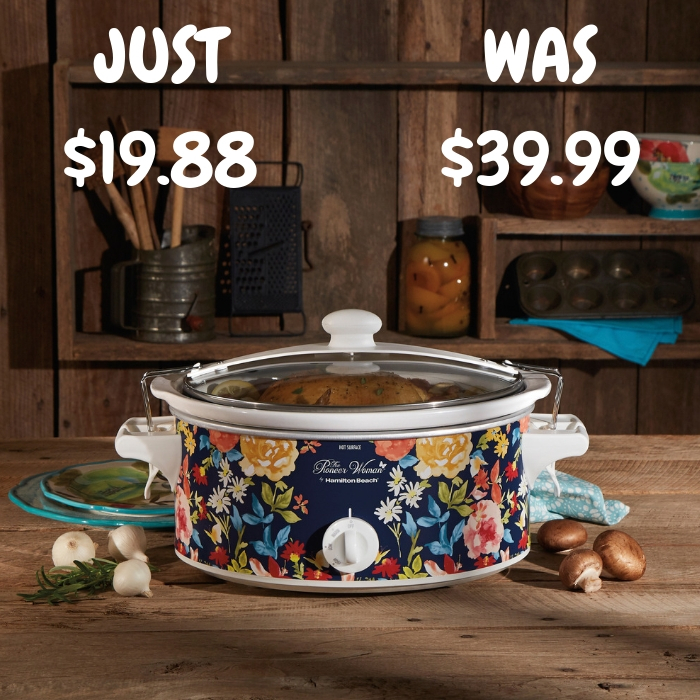 Walmart has The Pioneer Woman 1.5-Quart Slow Cooker 2-Piece Set on sale for just $23.99 down from $44.99 PLUS FREE store pick up or FREE shipping for orders $35 or more! 8.5″ Salad Plate 4-Piece Set Just $13.99! Down From $29.99! Walmart is currently offering The Pioneer Woman 8.5″ Salad Plate 4-Piece Set for just $13.99 down from $29.99 PLUS FREE shipping for orders $35 or more! Get ready to entertain for the holidays with a four-piece set of 8.5″ round The Pioneer Woman Salad Plates. They feature a scallop-shaped design and are a light-hearted and whimsical choice for your table setting. Dinner time will be a delight with the sturdy composition and cheerful design of these lovely ceramic pieces. They flaunt a decorative red and green leaf edging with poinsettia accents and a Christmas tree in the center. Use these Holiday Cheer salad plates on their own, or pair them with other matching pieces from the Pioneer Woman seasonal collection. 3-Piece Canister Set Just $12.88! Down From $26! 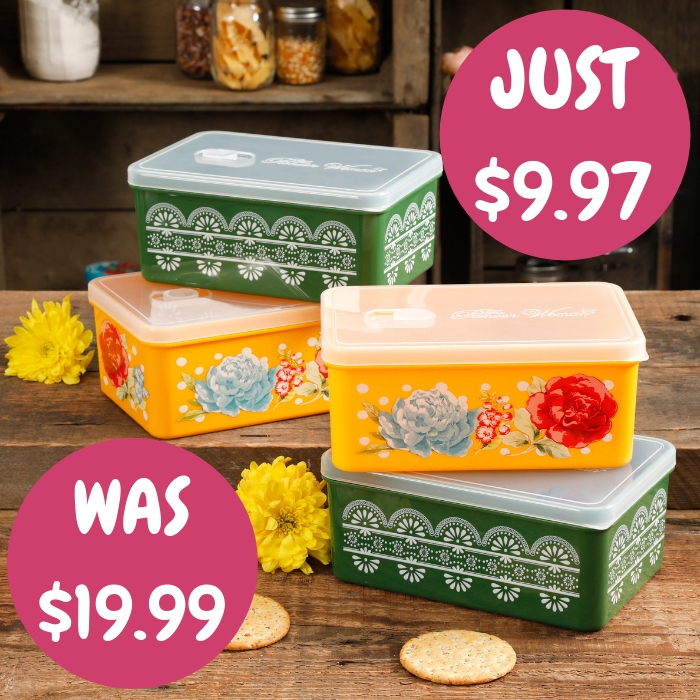 Head over to Walmart to score The Pioneer Woman 3-Piece Square Canister Set for just $12.88 down from $26.05 PLUS FREE store pick up or FREE shipping for orders $35 or more! Decorative and functional, the Pioneer Woman Flea market 3-Piece Canister Set is ideal for storing coffee, tea, flour and more. You can even use them for your baking supplies, bathroom supplies, pet supplies and craft supplies. 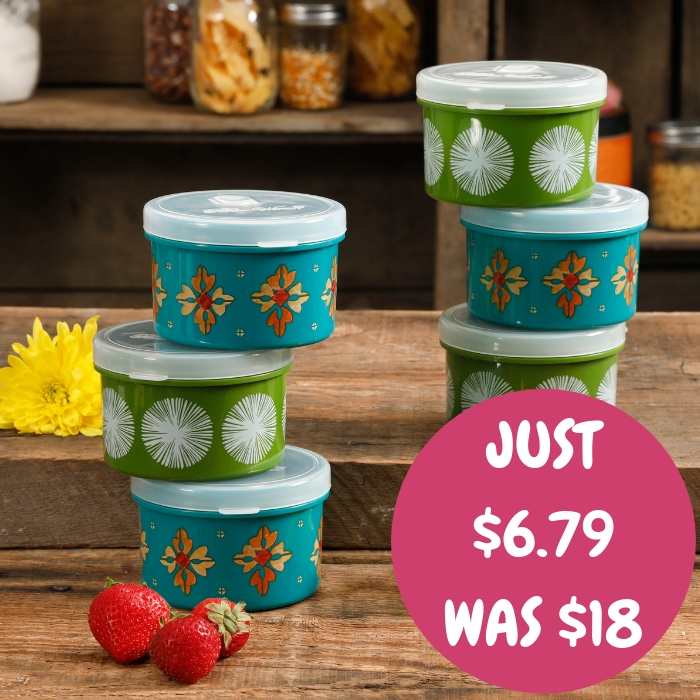 Versatile and stylish, this set adds a touch of charm and color to your countertop while providing easy access to your most used sugar and spices. The kitchen canister set also makes an ideal gift for you or any new homeowner. 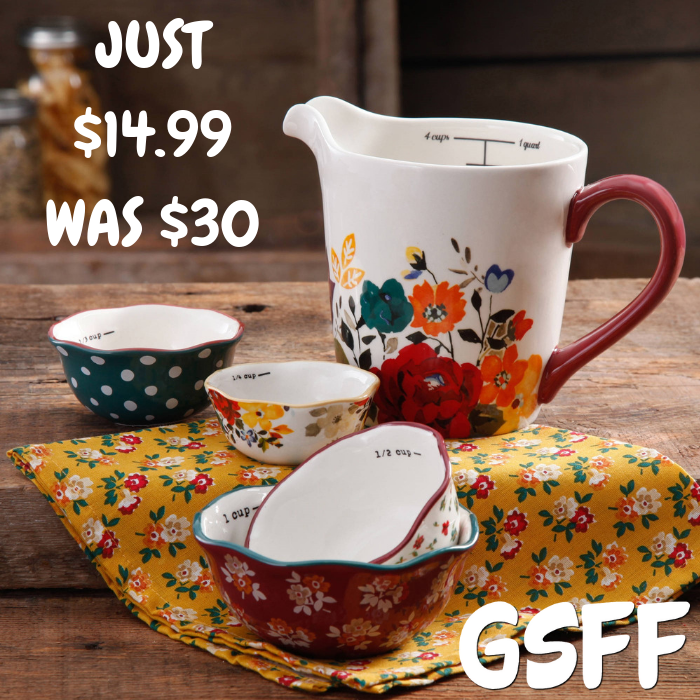 5-Piece Measuring Bowls & Cups Just $14.99! Down From $30! Walmart is currently offering The Pioneer Woman 5-Piece Measuring Bowls & Cups for just $14.99 down from $29.79 PLUS FREE store pick up or FREE shipping for orders $35 or more! Create favorite meals, snacks and desserts with The Pioneer Woman 5-Piece Prep Bowl Set, 4-Piece Measuring Bowls and 4-Cup Measuring Cup. All are made of durable stoneware, and each piece features unique designs ranging from floral, geos and fun dots. These dishwasher-safe bowls are ideal for everyday use and make an fun ideal addition to your kitchen and cooking needs. Give them as a gift to yourself or for any special friend for a wedding or house-warming occasion. 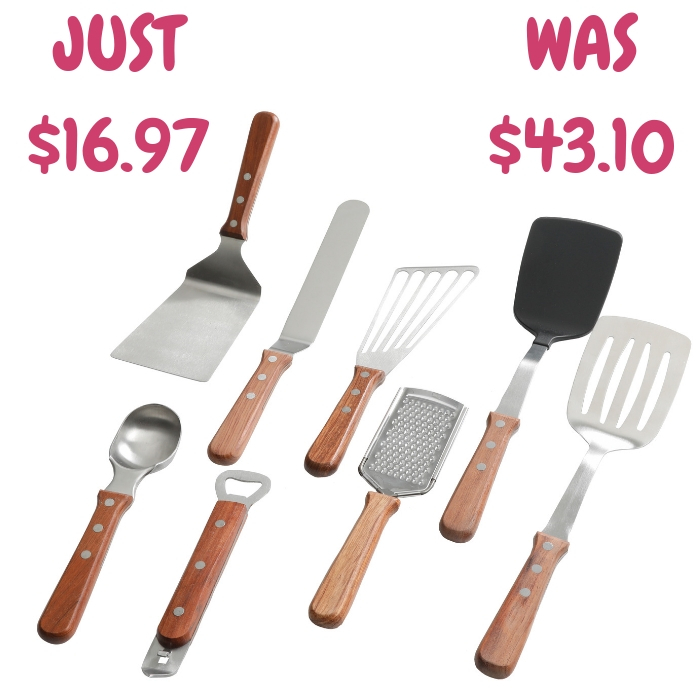 Their durable composition, along with assorted hand-painted designs makes it an excellent choice for any home cook. 20-Piece Linen Dinnerware Set Just $29.99! Down From $59! 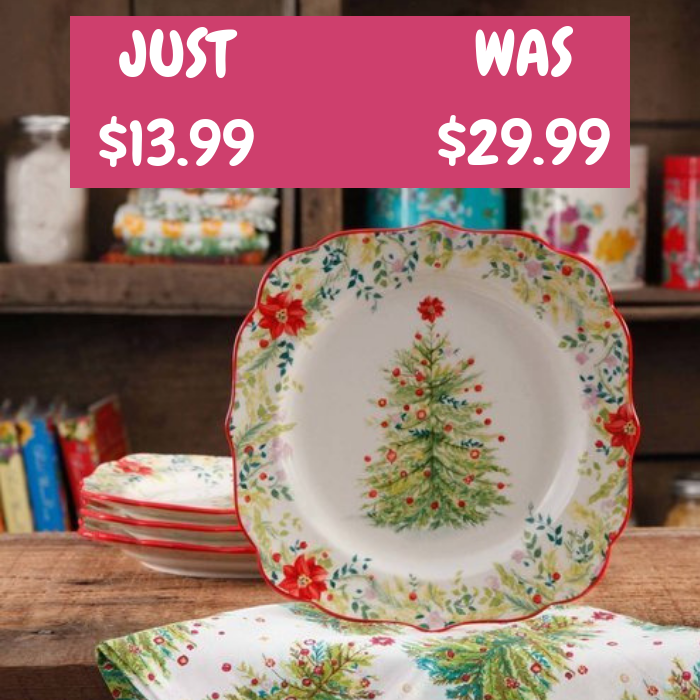 Head over to Walmart to score The Pioneer Woman 20-Piece Linen Dinnerware Set for just $29.99 down from $59 PLUS FREE store pick up or FREE shipping for orders $35 or more! 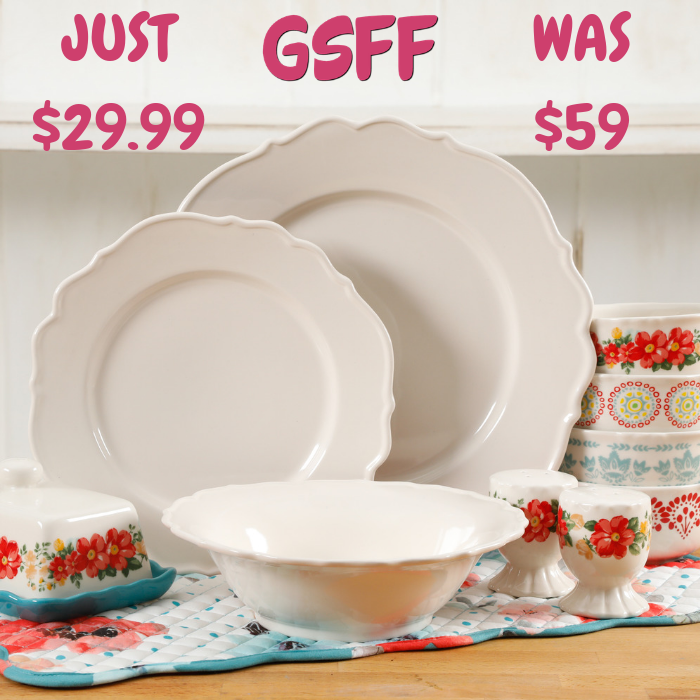 The Pioneer Woman Vintage Ruffle 20-Piece Linen Dinnerware Set The Pioneer Woman 20-Piece Vintage Ruffle Dinnerware Set is composed of durable stoneware that is dishwasher- and microwave-safe for convenient prep and cleanup. Available in two shades, denim and linen for the ideal fit with your color preference. The vintage ruffle dinnerware set includes four dinner plates, four salad plates, four bowls, four berry bowls, one butter dish and a set of salt and pepper shaker. Perfect for family meals, small dinner gatherings or as an add-on to your existing dinnerware collection. Make your meals memorable and elegantly simple with these dinnerware dishes. Coffee Cups 4-Piece Set Just $7.94! Down From $16! Walmart is currently offering The Pioneer Woman Decorated Coffee Cups 4-Piece Set for just $7.94 down from $15.88 PLUS FREE shipping for orders $35 or more! 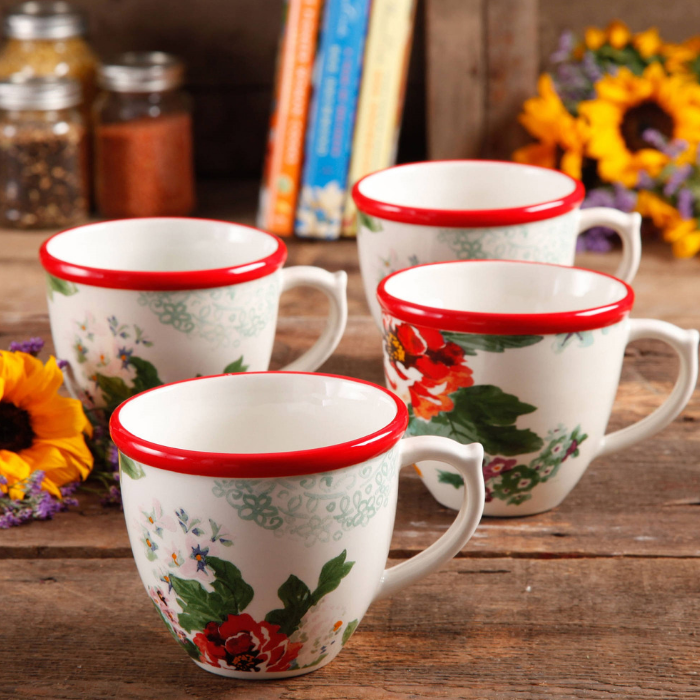 Enjoy your favorite hot beverage with these Country Garden Pioneer Woman Flea Market Stoneware Coffee Cups. The beautiful design features floral patterns and red accents. These 17-oz coffee mugs come in a convenient set of 4. Made from stoneware, they are dishwasher- and microwave-safe. 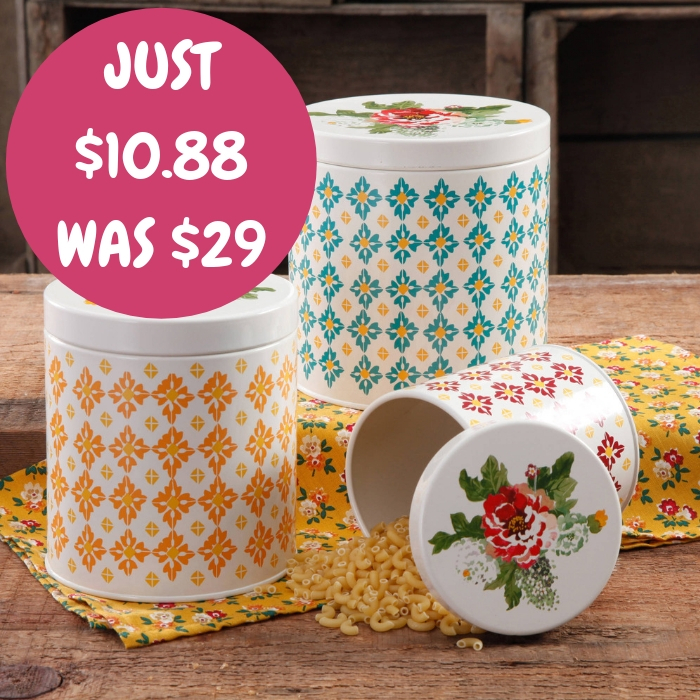 This bright and colorful set will make an excellent addition to any kitchen collection. Garland 10-Inch Pie Pan Just $7.49! Down From $20! Check out The Pioneer Woman Garland 10-Inch Pie Pan which is on sale at Walmart for only $7.49 down from $19.88 PLUS FREE shipping for orders $35 or more! Made of durable stoneware, The Pioneer Woman 10-Inch Pie Pan is dishwasher, microwave, and oven safe for easy cleanup and maintenance. The Pioneer Woman Garland 10-Inch Pie Pan. 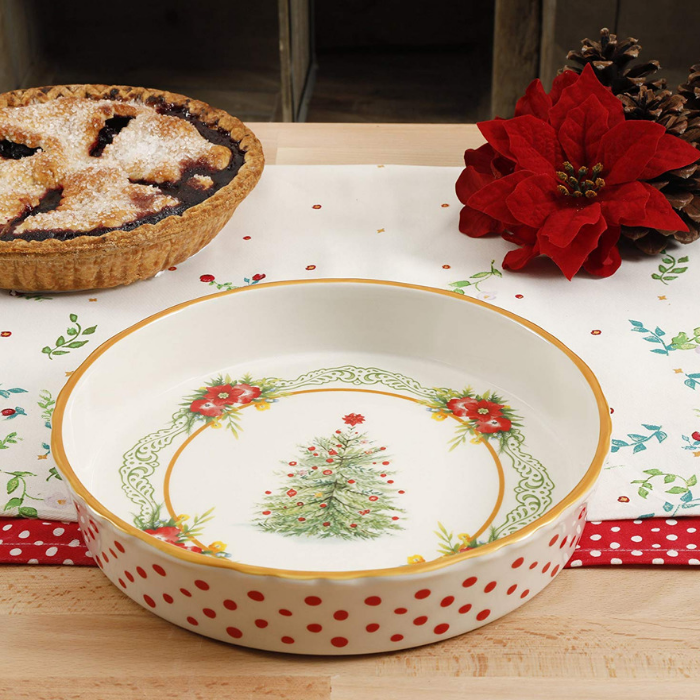 The Pioneer Woman Garland 10-Inch Pie Pan is ideal for baking and serving up your favorite Holiday desserts. Be sure to take a peek at the matching dinnerware and serving pieces for an even bolder holiday statement! Made of durable stoneware, The Pioneer Woman 10-Inch Pie Pan is dishwasher, microwave, and oven safe for easy cleanup and maintenance. 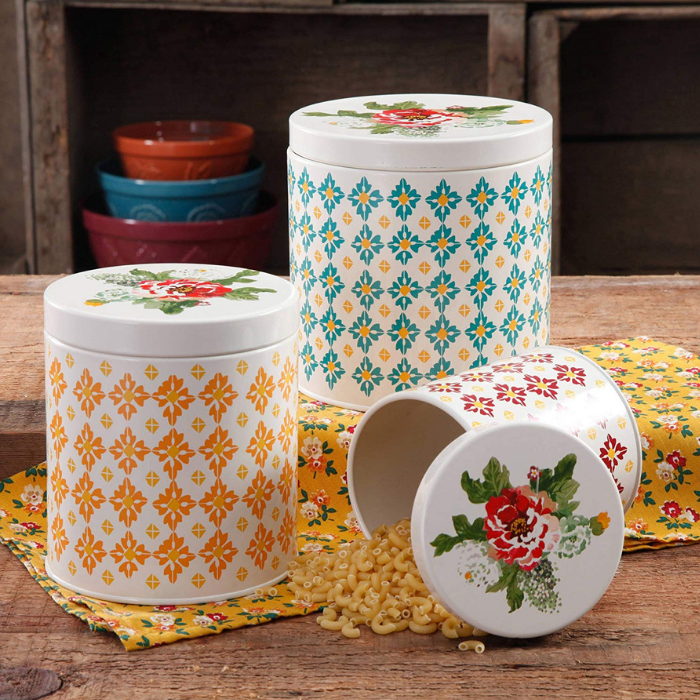 Vintage 3-Piece Canister Set Just $10.88! Down From $29! Walmart is currently offering The Pioneer Woman Vintage 3-Piece Canister Set for just $10.88 down from $28.79 PLUS FREE shipping for orders $35 or more! The Pioneer Woman Cookie Jar Just $10.88! Down From $18! At Walmart, you can score The Pioneer Woman Glass Cookie Jar for just $10.88 down from $17.93 PLUS FREE store pick up or FREE shipping for orders $35 or more! 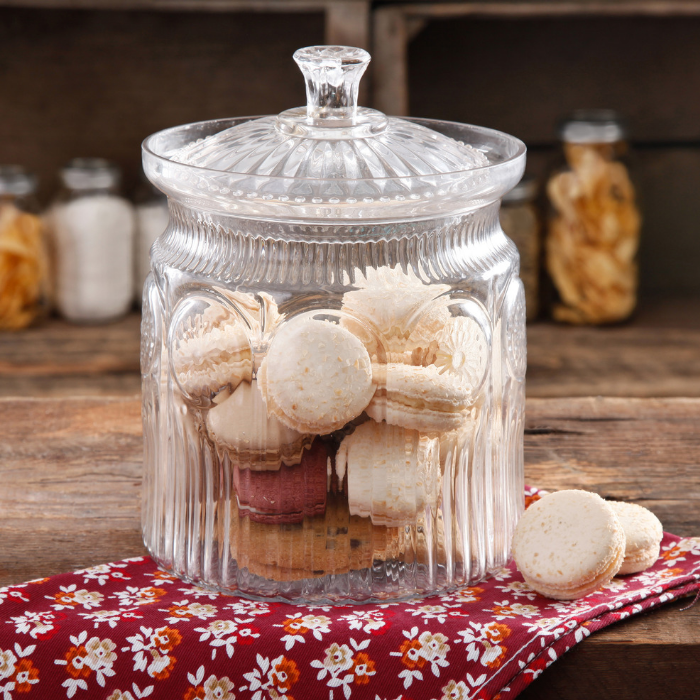 Bring a fun, retro look to your kitchen storage with the Pioneer Woman Adeline Cookie Jar. The jar is designed to stand out in your home with intricate embossed designs that deliver a classic farmhouse feel to your pantry. It is also available in two colors (clear, turquoise) that easily match with other items in the Pioneer Woman Collection. This cookie jar is also highly functional and can easily store all the treats needed for a hungry family or a home filled with guests. The lid also includes a silicone gasket to ensure that your delicious cookies stay fresh. The Pioneer Woman Adeline Cookie Jar is a must-have for any of Rees fans especially if they like baking. To prolong the life of this beautiful piece please hand wash.